Vadodara can be a real surprise to those who might have a perception that the place is all about delicious Gujarati food and nothing more. From adventure parks to picturesque waterfalls, Vadodara has some great spots where you can pack a picnic to have a gala time with family or friends. The soaring temperatures might make the life monotonous, but with the range of famous picnic spots in Vadodara, one can never really complain of boredom while they are visiting this city. Famously known as the 'Milk Capital of India', Anand has some of the most magnificent establishments in the country for milk production and manufacturing of dairy products. The quiet village has a certain rustic charm that will give you a beautiful day off from the hullabaloo of the fast-paced city life. There are also a couple of archaeological monuments such as Jama Masjid and Bharuch Fort which makes it up as a beautiful picnic spot near Vadodara that will reward you with a generous amount of some old-world charm. Make sure you do visit the Amul Dairy, click some fantastic shots of the forts and cook a nice meal. For all the trekkers out there, Zarwani Waterfalls is just the right place for you and your gang. Located in the wildlife sanctuary of Shoolpaneshwar, these Waterfalls offer some stunning sights of water gushing through the rocks with loud uproar. For a one-day picnic, this is the ideal spot where you can indulge in trekking or go on a safari to explore the richness of flora and fauna in the area. The best part of being here is the disconnect from technology for a day as your mobile phone will refuse to pick up any signals in this serene spot. Situated in the Jambughoda Tehsil and approximately 70 km from Vadodara, Jambughoda Wild Life Sanctuary, is a peaceful green landscape as you can spot bamboo and mahuda trees primarily, among the other numerous species of flora and fauna that make this place alive and among the famous tourist spots in the region. Some of the wildlife species that you should be excited to spot are leopards, jackal, wild boar, sloth bear, hyena, nilgai (blue bull which is the largest antelope in Asia), barking deer, and chausingha (four-horned antelope). To spend a lovely day with your family amidst nature, this is a must-visit spot. If you plan to stay overnight, you can avail the facility of the forest rest house beside the Kada reservoir in the sanctuary. Things to do: Treks and Safaris, Walk in the forest, Camp with family. Fun in water slides and rides never gets outdated. With a fantastic range of water activities to keep you and your family engaged, Ajwa Fun World is among the best picnic spots near Vadodara that you can visit. Enjoy the splash of water as you explore the rides and have an enthralling experience here. There is also a Food Court that serves delicious Gujarati dishes that will keep you asking for more. Things to do: Enjoy the Rides, The Slides, The Food, some shows and then relax. In need of some spirituality and calm? Then Dakor is the place waiting for you. A popular tourist attraction, this place has numerous beautiful temples built in the 18th century, devoted to Lord Krishna. Shree Ranchhodraiji is the magnificent temple that you should visit as this is a holy pilgrimage site. The architecture, as illuminated in the bright sun, offers a splendid sight during winters, which is the ideal time to visit the place. There are small eateries where you can enjoy a peaceful meal with your family or simply grab a decent spot and spread out your rug to enjoy the homecooked delicacies. Things to do: Get to the aarti early morning, Stroll in the village, Learn about the significance of the place. For those of you who are seeking some adrenaline rush this weekend and get some frame-worthy pictures clicked, head out to the S Cube Water Park to enjoy some thrilling water rides. The Amusement Park has Columbus, Paddle Boating, Giant Wheel and many other attractions to keep the fun quotient high as you explore one ride after the other. It is up to you whether you want to pack some snacks from home for the picnic or enjoy the delectable food items available at the Food Court at the site. Make sure you wear your wristband which will be given upon the entry to the park as this will provide you with access to every corner of the park. As the river Narmada flows through the state of Gujarat, in the middle, there is a scenic island which can be conveniently reached by boats. The majestic Banyan tree which has been on the island for decades has now covered an area of almost three kms. This is a perfect picnic spot near vadodara as you can plan a day out with your family and spend some quality time under the tree, munching on the sandwiches and enjoying a fun card game. The boats start from the Shuklatirth Shiva temple. One of the most talented poets, Kabir used to stay here, and that's where the inspiration for its name comes from. The peace that you would get to enjoy here is sheer bliss indeed. Things to do: Get a boat ride, Play some games with Friends and family, Relax under the shade of the Banyan Tree. 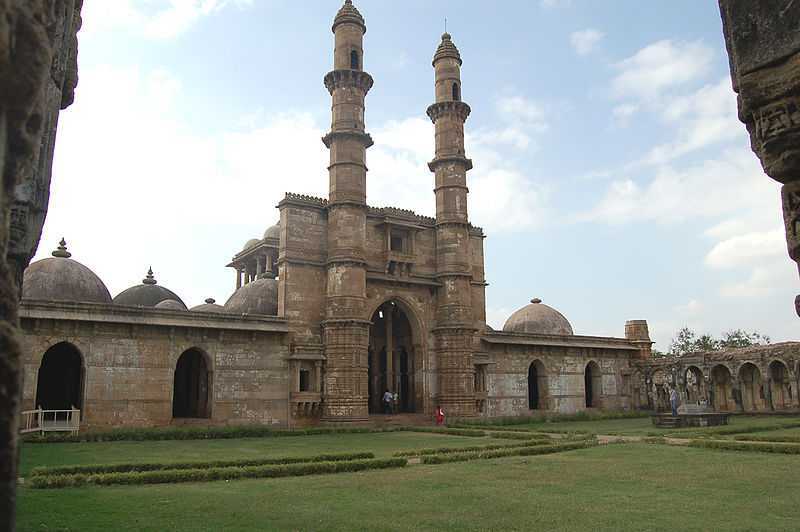 If you have a family of history buffs, then visiting Champaner, the archaeological site should be on your must-visit list. Being a UNESCO World Heritage Site, located in Panchmahal district, this place is a popular tourist destination. Trace your footsteps to go on a journey of a bygone era and explore this hidden treasure as you marvel the gem of architecture at this place. Plan a picnic around the monsoon season and be mesmerised with the sheer beauty of this place as the bright green moss drapes the gigantic tree trunks. Whether it is Shahar ki Masjid or the Jami Masjid of Champaner, the stone carvings are just fascinating to watch. Considered among the most picturesque waterfalls in the region, Hathni Waterfalls presents a jaw-dropping sight to its visitors as the 100-meter tall white veil-like waterfalls fall into the area which is covered in the lush green natural carpet of different flowers and trees. The sound of tumbling water on the rocks is a melody to the years as you find a nice corner to enjoy the delicious homemade snacks that you had packed for your picnic. During the monsoon, the gushing water creates a scenic wonderland. The Waterfalls are located in Jambughoda, roughly 80 km from Vadodara. The local tribal community believes that the rock at the base of the waterfall resembles a baby elephant, which explains the nomenclature. There is also a cave from where the Waterfalls originate, which resides a Hanuman Temple which is must-visit while you are in the area. Things to do: Be amused by the Waterfall, Visit the Hanuman Temple, Play some fun games, Munch on some snacks with Family and friends. There is no doubt that there is an abundance of picnic spots near Vadodara to explore in different seasons, all around the year. These impressive themed-amusement parks, waterfalls or even wildlife sanctuaries, Vadodara has it all that it needs for someone to enjoy a peaceful day with family or friends, enjoy a nice meal, play some games and capture some beautiful moments of the day in your camera. So, do not let any of your weekends go free and rather plan a picnic to each one of these places and explore the areas near Vadodara to know your city more.